The New York Botanical Garden (NYBG) and the Poetry Society of America present Monet’s Garden Poetry Walk: Monet to Mallarmé, through October 21. If you’re planning to be in New York, take a stroll. 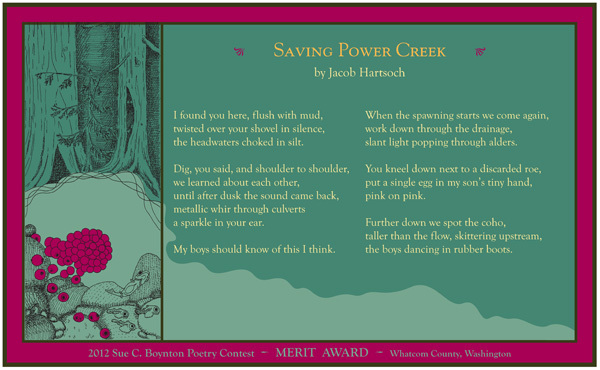 Meanwhile, you can find out more about the exhibit and read the poems on the NYBG website. the headwaters choked in silt. a sparkle in your ear. My boys should know of this I think. slant light popping through alders. the boys dancing in rubber boots. *Copyright 2012 by Jacob Hartsoch. Placard design by Egress Studio. at the end of each day’s trek. carrying the weight of our bounty on our backs. as wolves sang old songs from memory. without knowing you would be the first to depart. stuck in the tundra somewhere. They say your wings fell off. softening you into an otherwise hostile terrain. 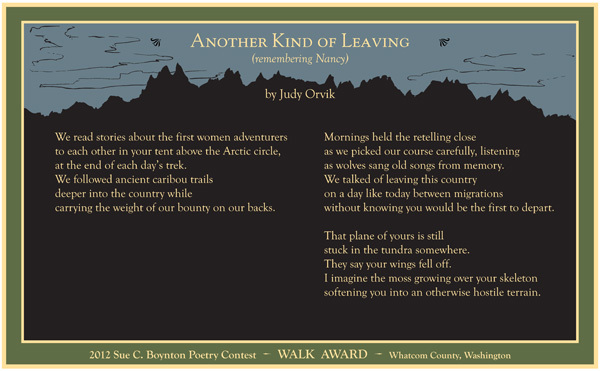 *Copyright 2012 by Judy Orvik. Placard design by Egress Studio. Here’s another poetry walk for your world poetry map, this one in West Yorkshire, in the north of England, near the town of Ilkley. 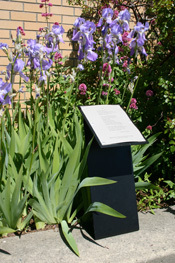 “Stanza Stones” is an ambitious collaboration between poet Simon Armitage, stone carver Pip Hall, the Ilkley Literature Festival and numerous other individuals and organizations. Six poems by Armitage — Rain, Mist, Snow, Dew, Beck (a creek or brook) and Puddle — describing forms of water in words “inspired by the language and landscape of the Pennine Watershed” were carved by Hall into slabs of stone on a 47-mile walking trail between Armitage’s home town, Marsden, and Ilkley. The 18-month project involved a number of workshops and master classes with young writers, who also collaborated with dancers and film makers in responding to the poems and the landscape. A book, Stanza Stones: The Anthology, includes the poems, photos, maps, artists’ statements and details from the collaboration. You can learn more about the Stanza Stones on the Ilkley Literature Festival website or on Facebook. To see other poetry walks, scroll down to the Poetry Walks section of the links, at right. 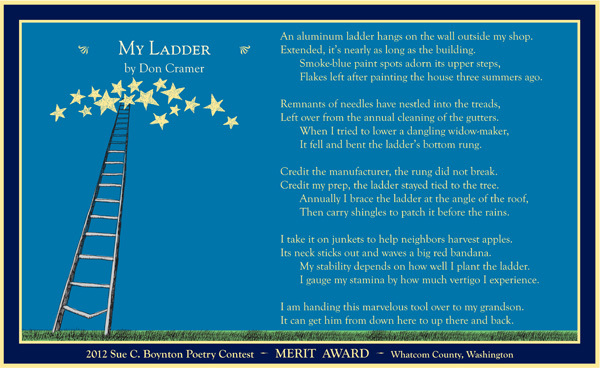 An aluminum ladder hangs on the wall outside my shop. Extended, it’s nearly as long as the building. Flakes left after painting the house three summers ago. Left over from the annual cleaning of the gutters. It fell and bent the ladder’s bottom rung. Credit the manufacturer, the rung did not break. Credit my prep, the ladder stayed tied to the tree. Then carry shingles to patch it before the rains. I take it on junkets to help neighbors harvest apples. Its neck sticks out and waves a big red bandana. My stability depends on how well I plant the ladder. I gauge my stamina by how much vertigo I experience. I am handing this marvelous tool over to my grandson. It can get him from down here to up there and back. *Copyright 2012 by Don Cramer. Placard design by Egress Studio. These are astonishing, obsessive, exquisitely-wrought word-works. See more. Look here.